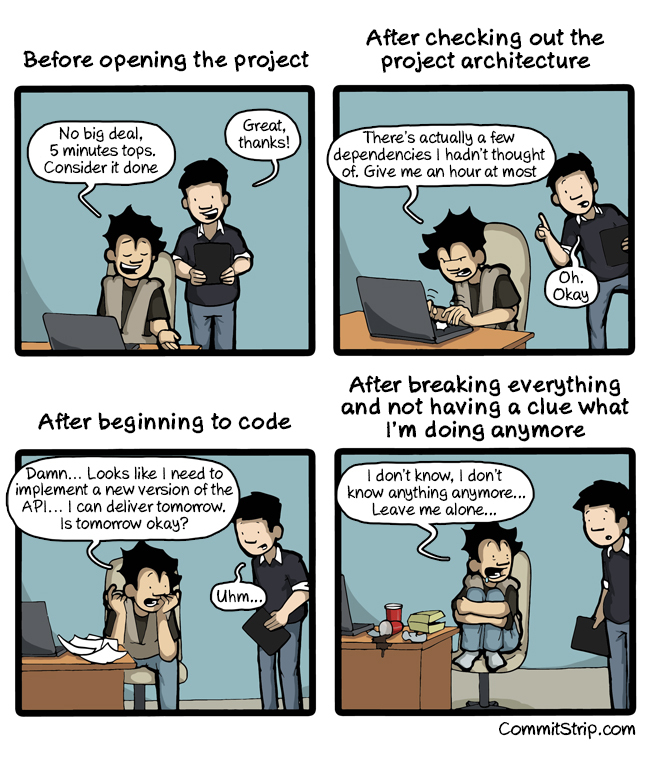 I'm pretty sure that just about every single developer who has worked any amount of time in software development has gone through this at one point or another. I've even worked with some who seem to make this a weekly routine. It's a well-known fact that software developers are not good estimators. We tend to fall into one of two groups - we either underestimate by a lot (just like the developer in this comic strip) or we overestimate by a lot (usually just to compensate for our poor estimation skills). The key work here is a lot. It's not really anyone's fault that this sort of thing happens. Software development is full of unknowns, no matter how much experience you have, or how many times you've done something similar. All it takes is a single unexpected thing to pop up to wreak all sorts of havok in even the best of plans. Worst of all, these tiny unknowns can lead us through a rabbit hole that will leave us like the poor developer in the comic strip (or rocking back and forth under the desk while clutching my knees - not that I would know about that...). My favorite Quora response of all time can explain this a lot better than I can. As a freelancer / consultant, one of the first questions I get from potential clients is "How long will this task take? ", especially when you're doing hourly billing. It's a fair question to ask. It's also a nerve-wracking question to ask sometimes. I have noticed myself often underestimating with these questions because I feel that if I give the higher end of my estimates, the client will think I'm exaggerating just to get paid more. This might not be true, but that's the mentality I've gotten when giving estimates for work where I'll be paid by the hour. When I began talking with prospective clients, I would offer estimates based on my experience with certain things. With Ruby on Rails applications (and web development in general) there are not too many unique things to do. The majority of it boils down to putting things in a database or displaying them somewhere in a web browser. There's not a lot of unique work in the backend for these types of projects, so I would just estimate how much that has taken me in the past. But that was a horrible way of estimating - you never know what's lying underneath the surface. Now, whenever someone asks me for time estimates, the first thing I ask for is access to their code so I can assess properly. Some clients balk at this, unfortunately, since they don't want anyone who they haven't hired looking at their super-secret code (which is really not that secret unless you have some patented technology there). But this is the only way I can provide a fair estimate, so this is a requirement for me now going forward. Most of the prospective clients who come my way are looking to hire someone because they don't have enough technical help to get their site functioning. This is where asking to see the existing code comes in handy, since they won't be able to answer questions themselves. But something I'm also doing is talking with any existing or previous developers who have worked on this project. Developers, for the most part, are pretty open when speaking with other developers about a project. They'll tell you plenty about the project you're working on since they've spent so much time on it before. I've gotten a lot of answers to questions I haven't even thought of when asking someone to tell me about the 'gotchas' about a specific project. In the code directory, pull the latest changes from their code repository. Restart all other services manually. Cross your fingers that you didn't screw something up and brought the site down. Even though this is a highly error-prone process, knowing about it beforehand let me communicate to the client (who was non-technical) that it would take a bit longer than I expected since I had to manage this deployment process. If the work you're doing is similar to something that has been previously done in the project, ask the client how long it took the last time the work was performed. This is a good indicator about how things can go. In another example, a former client thought the time I was estimating for a certain task was too high. Since he mentioned that this work had been done in the past, I asked him how long it took the last time. He didn't know off the top of his head, so he said he would look it up and get back to me. A day later, he emailed me saying that the task had taken a previous freelancer twice as long as the time I was estimating. Thankfully it took me just about that time, so it was a better deal for him. Remember, the past is the best predictor of the future. Of course, these aren't bulletproof. While software development is relatively young, people have been doing this for over 50 years and estimation is still one of those things that, despite good intentions, will continue to be hit and miss. We'll just continue to do our best, and in the meantime I estimate it'll get better soon.